BEFORE uploading media files for the transcription and captioning service check, and if necessary, update your Other Language Transcription Settings. At the time of upload your files immediately take all current settings and these settings cannot be reconfigured once submitted so it is best practice to always do this before uploading. Please note: Other Language Transcription Settings are a project-level setting and not a user-level setting. Any changes you make will be applied to your project and could impact other users! To view your project's current transcriptions settings click Settings followed by Other Language Transcription Settings. There are five components to your Other Language Transcription Settings. PLEASE NOTE: These settings will be sent as instructions to our third party translation vendor-Dotsub. 3Play Media Transcription Editors will not see these instructions and these instructions will not be applied to files ordered for English Transcription. Select from three different dialogue styles that determine how the speakers’ dialogue is formatted within your transcript and/or closed captions. I'm thirsty. Are you thirsty? >> Yeah. It's about time I got a sandwich. - I'm thirsty. Are you thirsty? - Yeah. It's about time I got a sandwich. I'm thirsty. Are you thirsty? Yeah. It's about time I got a sandwich. Here users have two options for captioning spoken audio. Select true so all spoken words/dialogue are captioned. Select false to not caption all spoken words/dialogue. Here users have two options for captioning on screen text. Select true to caption all text that appears on screen between square brackets [ ]. Select false to not caption all text that appears on screen between square brackets [ ]. Here users have two options for captioning sound effects. Select true to include all relevant sound effects between square brackets [ ]. Select false to not include all relevant sound effects between square brackets [ ]. Commonly used sound effects include but are not limited to: [♪ music ♪], [applause], [laughter], etc.]. 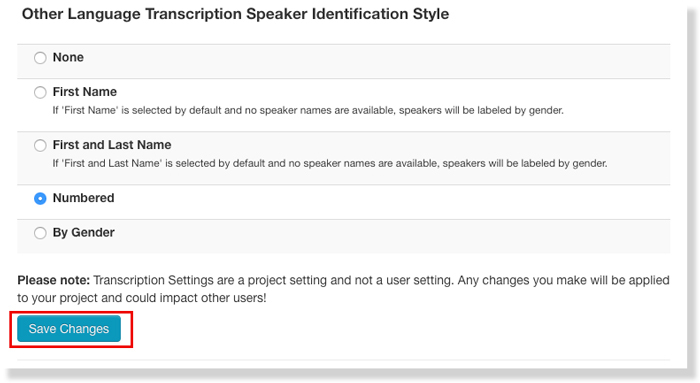 Change the way speakers’ identifications are labeled within your transcript and/or closed captions. None: Do not label speakers. Speaker changes are denoted by paragraph breaks only. First Name: Label speakers by first name. If 'First Name' is selected by default and no speaker names are available, speakers will be labeled by gender. First and Last Name: Label speakers by first and last name. If 'First and Last Name' is selected by default and no speaker names are available, speakers will be labeled by gender. Numbered: Label unidentified speakers as SPEAKER 1: SPEAKER 2: SPEAKER 3: according to when they chronologically appear in the file. By Gender: Label unidentified speakers by gender. A cheat sheet is added to help your transcriptionist provide you with the most accurate transcript possible. You may provide a glossary of terms or attach a PDF containing other relevant information. Note: This cheat sheet only applies to files that Other Language Transcription has been ordered for within the Project. PLEASE NOTE: If changes are made to your Other Language Transcription Settings be sure to click Save Changes before navigating away from this page.